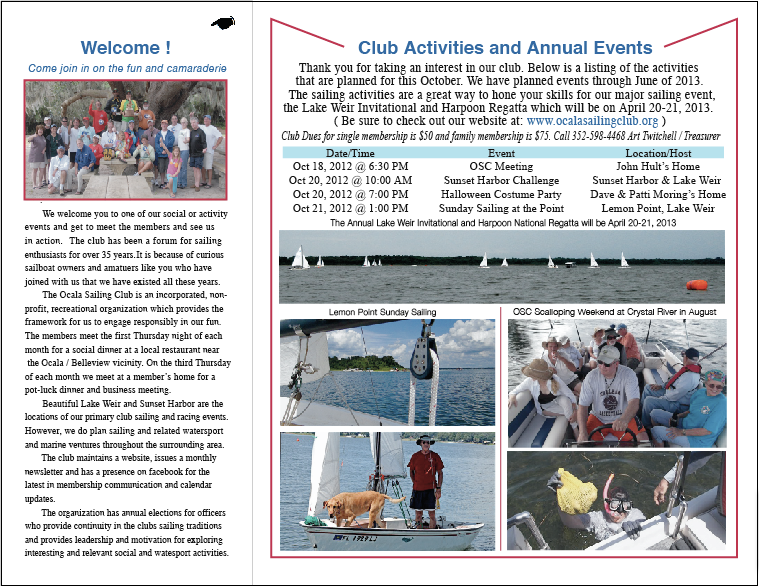 The Ocala Sailing Club was formed in 1976 by Bill Britt, a Hobie Cat sailor. Bill promoted sales, training and racing of the popular Hobie Cat sailboats in the area. Mono-hull boats drifted into the club and also joined in the sailing activities over the following years. In the beginning, sailing classes were held at the Central Florida Community College. Ken Johnson, owner of Johnson's Beach, the current location of "Gator Joe's Restaurant" on Lake Weir, helped Bill by providing water access to the lake for sailing events. 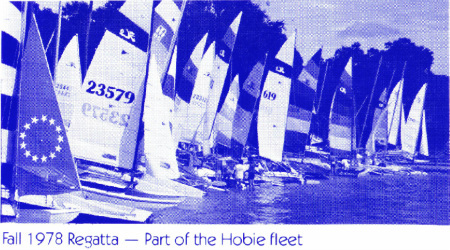 With the advent of new club members, the club evolved into Catalina 22 sailboats (a mono-hull sailboat ) and in 1981 hosted the Catalina 22 National Regatta on Lake Weir. In the 1980's and 1990's members were sailing boats from 20' to 52' as some members located their vessels in Tampa Bay and Yankeetown areas. Local sailing was done on Lake Weir and Sunset Harbor. Now, in the 2000's, our members represent boats ranging in size from 14' Sunfish to a 23' Hunter, including some catamarans. Since the club members own such a large number of 17' Harpoons the Ocala Sailing Club now has been the sponsor of the National Harpoon Regatta held right here on lake Weir for the last 9 consecutive years. We are always welcoming new members to join us in our social and activity events. It is because of curious local sailboat owners and amateurs that we have been a vibrant club for all of these 38 years. 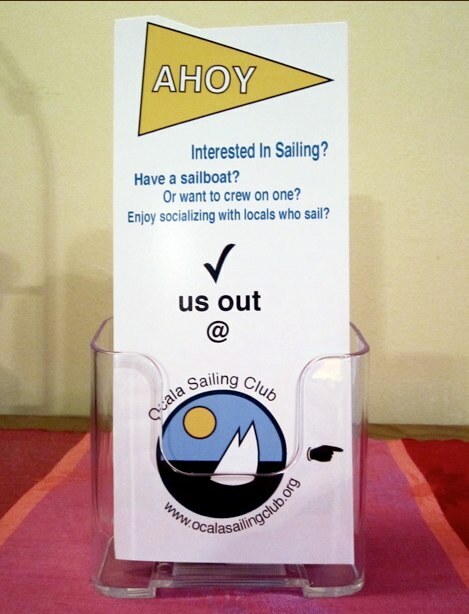 The Ocala Sailing Club is an incorporated, non-profit, recreational organization which provides the framework for us to engage responsibly in our fun. The members meet the first Thursday of each month for a social dinner at a local restaurant near Ocala / Belleview vicinity. On the third Thursday of each month we meet at a member's home for a pot-luck dinner and business meeting. Beautiful Lake Weir and Sunset Harbor are the locations of our primary club's sailing and racing events. However, we do plan sailing, water-sport and marine ventures throughout the surrounding area. The club maintains a website, issues a monthly newsletter and has a presence on facebook for the latest in membership communications and calendar updates. The organization has annual elections of officers for maintaining the continuity in the club's sailing traditions. It also provides leadership and motivation for exploring interesting and relevant social and water-sport activities. Come join in on the fun and camaraderie! 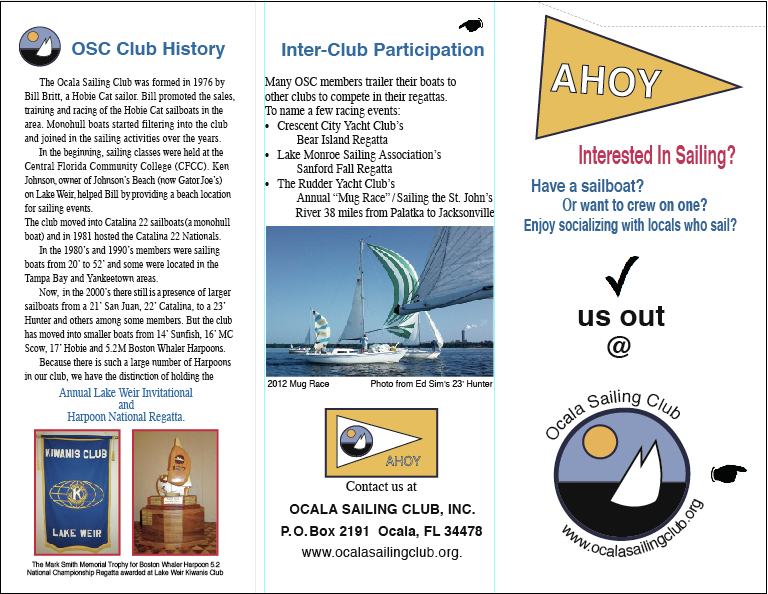 Our website is: http://www.ocalasailingclub.org or find us on facebook "Ocala Sailing Club".